Spring is here, sort of! We had two weeks of almost 80 degrees and then winter came back! We are having more seasonable weather and I am feeling sorry for all the plants that were tricked into thinking it was time to bud. I hope they do not suffer to much with the return of the cold weather. Not a lot has been going on here in Northern Michigan. I am still knitting up a storm. So far I have made three pairs of socks, five hats but no mittens finished this year. I am working on a pair of mittens, stranded color work and they are looking good so far. This is only my second item in stranded color work and I am liking it. Next I am going to tackle a pair of top down mittens in color work. I do have a pair of tatted baby bootees half done. Need to get busy and finish them up and I promised my mil I would be sending her some more soon. This pair is in normal baby colors, pale blue and I have a second pair in pink waiting to get started. It doesn't take me long to make a pair just right now I would rather be knitting. As for sewing, I have several projects going there to. One is a Capri outfit for my great granddaughter, a medicine bag for my second daughter and one for her youngest son. I would like to do something for my oldest daughter but haven't decided what yet. So far this year we have had two deaths in our family and we were hoping for a better year after last year. It is strange but it is not our oldest generation that is going but a lot of younger cousins. Last year we lost several cousins around my age and that is scary. Golf season is right around the corner and I was hoping for a few weeks to get out and play before my leagues start. So I am hoping April is a warm month. None of those 40 degree days we generally get in April. So I haven't done a good job! Here it is January 30, 2012 and I am just getting around to updating my blog. So much for weekly updates. As to my other lists of things I hope to accomplish. I have finished 3 of the 12 hats. One pair of socks, no mittens, I haven't written a thing yet. Nor have I done any tatting! But I did get fired from my tatting job. The shop owner decided she didn't want to pay me what I had asked for this time and so she has cancelled the class and requested my address so she can mail my samples to me. Sounds like she doesn't want me in her shop for any reason. That is okay, I have always ordered my tatting supplies online and I can order all my yarn that way too. But I do wonder if she found another tatting teacher who will teach for less than what I wanted. It is to far away to just drive over to check. So I now have all day Tuesdays to work on my project until the end of April when golf starts. My daughter in Alaska has been dealing with the coldest winter on record. She has had several days of cold temps, 50 to 60 below zero, not what I want to experience. It is cold enough here in Michigan to keep me indoors. She is hoping to move from the Interior of Alaska to Soldnata which is south of Anchorage and 30 to 40 degrees warmer. Still below zero abut not as cold.as where she is now. She will at least then be on the power grid and won't have to depend on a generator for electricity and she will have natural gas for heat instead of wood. I feel much better already for her and the boys. She called me tonight and thanked me for the markers I sent to her boys for Christmas. The oldest boy was having a good time coloring on everything! The walls, the table and himself, didn't color his little brother but was looking to. Fortunately, for my daughter I sent them washable markers and she was pleased that they worked as advertised. She had already washed the walls so only had the table and boys left! Well, 2011 is drawing to a close and a lot has happened this year. I have a new grandson and a great granddaughter. Spent a month in Alaska. Neglected my garden and let it go to ruin hope to do better next year. My father is doing well and we are looking forward to a new year with him. I learned how to use my new embroidery machine and made several gifts for Christmas. Have several new designs picked out for shirts and bags next year. Taught a series of tatting classes and have another one lined up for the new year. I am getting my list ready for the new year with my goals laid out for me. I hope to knit 12 pair of socks this year most will be for gifts. I am looking at making 12 hats and 12 pair of mittens. 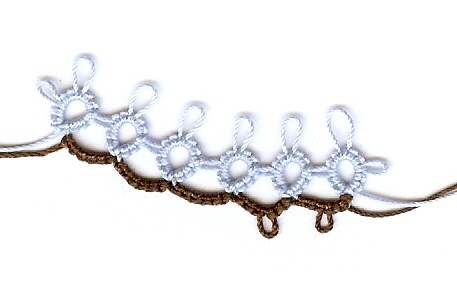 I also want to work on 12 tatting projects, just not sure what I will do with the tatting. I want to write at least new 12 poems and work on my stories that I have neglected for way to long. I plan to update this blog at least once a week and not leave it languishing for months at a time. Won't be to difficult with the winter months but spring and summer are difficult. So, I am teaching a hands on tatting class in Tawas, Michigan. Last Tuesday was the first class and I had two students show up. I had a lot of samples to show them and we discussed some of the differences in how patterns are written. Then we got into the nitty gritty business of tatting. Both ladies could make the double stitch at least once but were not able to repeat it a second time. I hope they were able to get it to work when they went home and were able to relax a little bit. They were having trouble getting the stitch to flip and I was not sure how to address the flipping of the stitch because it is so natural to me. I never even thought about it when I learned so I may have to do something different Tuesday if they still are not getting the flip. My sister is home from Nebraska and we have been having a great time. She has been spending a lot of time at my house this year more so than she has done in the past. So we have been doing come sewing and getting some things done in my house. Hopefully we can get some more of the my sewing room cleaned up and organized. It is difficult to find anything in there as I haven't done to much since I moved in three years ago. Just made room to get to my machines. I have material, tatting thread and yarn that needs to be stored and organized. Last week we celebrated my dad's 82 birthday. All five of us girls were here for the party. It has been a few years since we were all here at the same time. The only one missing was my brother and he thinks he needs an engraved invitation, which isn't going to happen! He needs to grow up and be a son to my father. It might be to late for him to do that, after all he is 54 years old now! The Year isn't over yet! Oh, my, I haven't been on here since January 2011. Must be I have been busy this year. I haven't done a lot of tatting this year, mostly been on a knitting binge. But, I am going to be teaching a tatting class starting next week! How cool is that? I was a bit apprehensive about doing it as I do not consider myself to be anywhere near an expert but we always want new tatters to join the ranks. I will be teaching in Tawas, Michigan I am planning maybe 6 weeks of classes. Will see how well versed the tatters I have are and how long they want to go on. This whole teaching thing started because I dropped off a pair of tatted baby booties last April at the knit shop and she showed them off and now I am teaching tatting. This year I also had two additions to my family, a new grandson in Alaska and a great granddaughter in Michigan. I now have one granddaughter and four grandsons and one great granddaughter. I am a lucky grandma. This weekend we are celebrating my fathers 82nd birthday. We are so blessed to still have him and 22 of us will be home to help him celebrate. That is only about half of us. The rest could not make it home as they all live out of state. All five of us girls will be here tomorrow. Only my brother will be missing and he refuses to come home without an "engraved invitation". We don't mind anymore as we have learned to adjust to his stupidity! Yes, I have a project! I have not given up on my tatting at all. Just to keep you up to date, I have decided to join the fun with Jane and her new TIAS. Here is my first installment. You can follow along on her Blog Tatting and not a lot else. It has been a while since I have played one of her games and I am excited to see what she has created for us. I have no idea what it might bee and may even have my picture upside down. Only time will tell as we tat this project. I am still making mittens and have finish four pair for the challenge. Plus the four pair I made before the end on 2011. I sent this pair to my sister in Nebraska. She fell in love with them. These were fun to make and a welcome change from plain classic mittens. I have a few in the challenge qqueue that are going to be very challenging this year some are color work and use very small needles. I am hoping to make a pair of trigger gloves for my son-in-law in Alaska as he is a hunter. I have never made gloves before so that will be a fun project. Just hope they are warm enough to wear when hunting in Alaska. I am currently working on a crochet project, a toy. It is a bumble bee and I have had the pattern for a while just have not been inclined to crochet. And oh, yes, I have lots of sewing projects to do. Always something to work on and no time to be bored! What is the other side? I feel like I have gone over to the other side. The other side of crafting? I have been knitting up a storm the last couple of weeks. I finished my crocketed Christmas Ball Gowns for this year and have moved on over to knitting. Mittens and hats. I joined a mitten challenge over on Raverly.com for 2011. To knit 11 pairs of mittens in the new year. While I can knit mittens and they are fast projects I am challenging myself to do more intriciate projects. 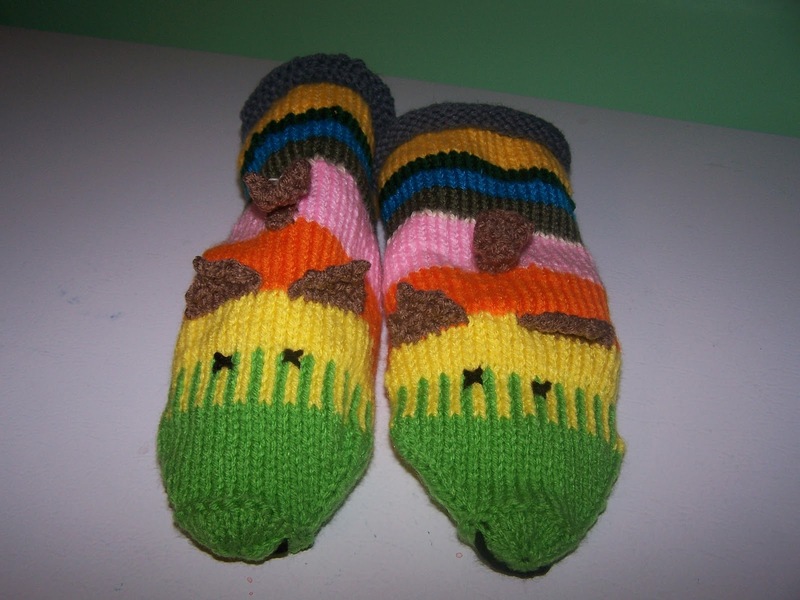 Mittens with pattern and lots of colors. Then I am going to make come baby things, hats, booties, blankets and maybe even a gown or two. I have no one in particular that I am making them for and may send some off to Newborns In Need. Or they may show up in my Etsy Shop, Keep Me Busy. It would be nice if I could sell enough to help with the cost of a trip to Hawaii that my daughter is planning for next November. I do have some tatting projects that I need to get busy on. My nephew is getting married in August and I hope to make a ring pillow for them. I have decided to just make it white as the bride can't decide on her colors. At least with white it can go with any color she chooses. I also hope to try to design some ball covers for Christmas balls for next year. I love to give my family and friends handmade projects and tatting is one of the unique things I can give to them. So, I have a busy year planned and need to stay focused and on tract. Maybe I should rejoin the 25 Motif Challenge and see if I can complete that with all my other projects. At least it would help me stay on track and make sure I get some tatting completed with all the knitting and sewing I have lined up.